Home > New Orleans Drinks > Coffee and Tea > Cafe' Du Monde Decaf Coffee & Chicory, 13 oz. 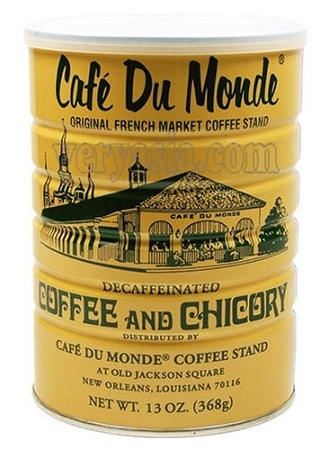 Cafe' Du Monde Decaffeinated Coffee and Chicory is a blend of dark roasted coffee beans and chicory. Cafe' Du Monde uses an Ethyl Acetate process to decaffeinate their coffee Ethyl Acetate is a natural chemical found in many fruits. This decaf coffee goes great with Cafe' Du Monde's Beignets or your favorite breakfast, snack or dessert. Comes in a 13oz decaf can with easy open Can and Lid.